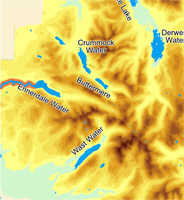 Although it flows out of Ennerdale Water, the River Ehen belongs equally to the west Cumbrian plains, forming the boundary between the mountains and the plains for most of its course. Parking is available at Ennerdale, and at High Wath close to Cleator Moor. The River Ehen flows out of Ennerdale Water. The Ehen flows west from Ennerdale Water, through Ennerdale Bridge, and then runs in a giant left-handed curve around the western edge of the mountains, marking the boundary between the high ground and the west Cumbrian plain. On its way it flows past Cleator Moor and Egremont, before reaching the coast close to Beckermet. Remarkably it then runs parallel to the coast at a distance of around 200 feet for nearly two miles. The Ehen and the Calder flow into the sea within a few feet of each other, at the southern tip of the Sellafield Nuclear Plant. At low tide the two rivers actually merge and cross the beach as one.